Meridian’s 381 Sedan was designed with safe, comfortable family cruising in mind. An extended bridge with L-shaped lounge provides great topside seating while underway. The large aft cockpit lets you get close to the water and provides convenient dockside access from the swim platform. A Sea Weed davit system makes dingy management a breeze, and cradles your tender right-side-up, allowing gear to remain safely inside while underway. Meridian’s Dock on Command systems provides finger-tip control of the bow and stern thrusters for precision docking, every time. Head below decks through the large, screened sliding door and you find a beautifully appointed salon complete with living-room-style opposed seating and a built-in entertainment system. Rich solid cherry woodwork, soft faux-leather upholstery and large opening windows make the salon a truly inviting space, with 6-foot 4-inch headroom throughout. Two-zone heat/air gives you full control of the interior climate during blistering summer days, and extends your boating comfort well into the cooler shoulder seasons. Galley space is well thought out with plenty of storage, solid surface counter tops, double stainless sinks, under-counter fridge/freezer, microwave and two-burner cook top stove. The full-size dinette opposite the galley seats four comfortably. Moving forward and down two steps, is a large port-side head with separate glass-enclosed shower stall with bathtub and cherry-wood vanity cabinet. The guest stateroom is to starboard with a large double berth and a cedar-lined hanging closet. The master stateroom occupies the bow area and has en-suite access to the head. The double island berth with inner-spring mattress has storage drawers below, and there is a built-in entertainment center and two cedar-lined hanging lockers. 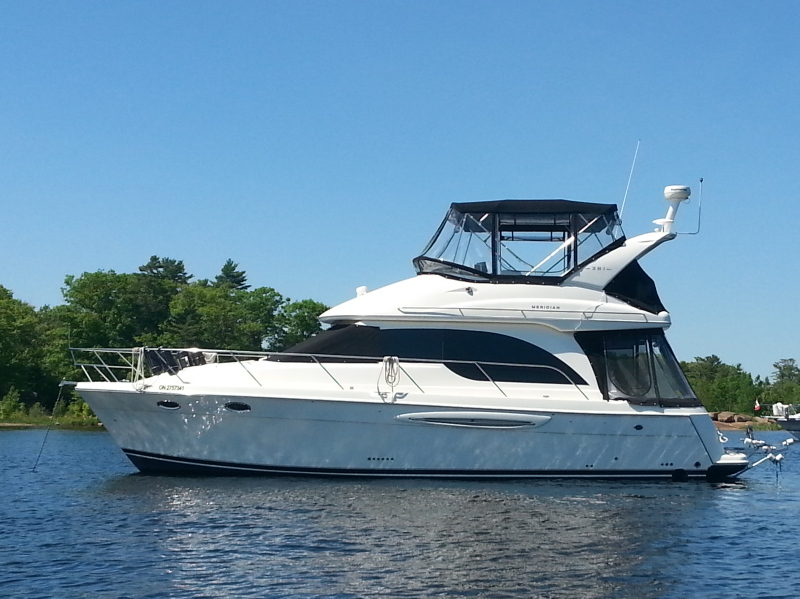 This low-hour Meridian 381 has been nicely maintained with numerous recent upgrades, including a 10kW generator, Raymarine C90 widescreen GPS plotter, new house and cranking battery banks, and a new refrigerator added in 2015. The complete list is available to interested buyers on request.